Our range of IRESS solutions cater to the diverse needs of individuals and institutions trading in Equity and Derivative markets. Through IRESS solutions, clients gain access to comprehensive market data and sophisticated market analysis tools. IRESS also provides clients with an extensive historical database, incorporating time-series data on security prices, exchange rates, commodity prices, economic data and market statistics. The IRESS integrated management system enables clients to streamline their trading processes and integrate seamlessly with Microsoft products such as Excel and other industry standard software tools. The FIX Protocol is the backbone of electronic trade communication that has benefited the financial industry as a whole with a faster and more efficient trade messaging system standard. Gleneagle Securities offers FIX API Connection for professional and institutional clients who have proprietary electronic, algorithmic or black box trading systems that require direct market pricing and execution. If you are a professional or institution, Gleneagle securities can provide you with a reliable FIX API connection that gives direct market access to multiple liquidity provider price streams quickly and efficiently. Gleneagle Securities offers clients the SaxoTrader platforms, with the ability to trade thousands of instruments across multiple asset classes from a single account. SaxoTrader: with the ability to trade thousands of instruments across multiple asset classes from a single account. 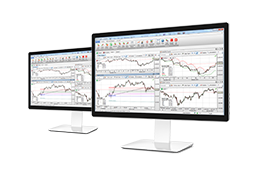 Easy to download and install on Windows machines, SaxoTrader is suitable for sophisticated traders who require advanced charting and custom, multi-screen workspaces. SaxoTraderGO: an intuitive HTML-based platform that allows clients to manage their portfolios easily on any device (iOS, Android and Web) from a single account. View market prices on more than 30,000 instruments across FX, CFDs, Futures, Options and Stocks. SaxoTraderGO gives you countless opportunities with zero complexity. Looking for a SaxoTrader Demo? Gleneagle Securities will provide you with access to a demo account from which you can explore SaxoTrader’s features and experience it first hand. Want to Go Live with SaxoTrader? Sign up for a live account with Gleneagle Securities and follow the instructions to trade the financial instrument of your choosing via SaxoTrader platforms. Rubix FX: offers 70+ tradeable instruments including Forex, Commodities and Indices. At Rubix, we provide trading access to 3 platform interfaces (MetaTrader 4, Rubix Prime or FIX API)depending on your trading needs; . Our high performance trading servers are based in Equinix NY4 and are cross connected to multiple liquidity providers to deliver ultra-low latency, reliable execution and consistently competitive pricing. Our mission is to provide to all our customers an exceptional service, high performance trade execution, and extremely competitive spreads with low fees and complete transparency. Click on below to view.